"Coming back to the awakin dinner, I have a funny story to narrate. I was in a quietened state after the meditation and to receive so much from the volunteers in that 'dinner ceremony' as I may call it, was just too much. 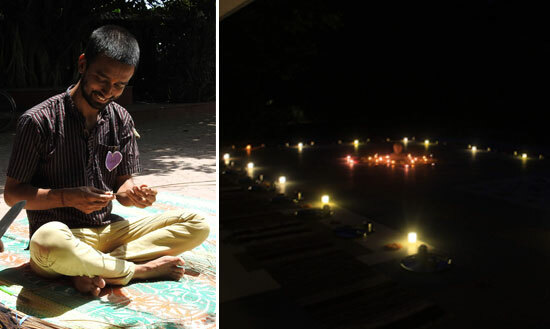 of course, the area was beautifully decorated with candles and rangoli, but the hands being washed by Sanchay with such peace and then volunteers standing with folded hands, was too much. By the time I had seated myself in my spot and the plate was laid, before any food would be served, I felt completely full. A poetic side of the self took over and lofty thoughts like "my heart has been deeply fed now and I am feeling so full with the love, that there is no need for any material food now for the stomach". For a few moments, there was an impulse to put this to action by refusing any food and just sitting there with the empty plate. However, given that it was a silent dinner and communicating this would have become a difficult affair (and that the aroma of the food was v attractive) I went ahead and ate a lot of everything. However, when I was on a flight back to Bangalore that evening, that thought revisited. Now it took form a critic and and was asking me "hmm, so, were you just doing poetic fantasizing that heart has been fed, now stomach doesnt any more feeding, etc. and pleasing your ego or did you really mean it?" in that moment, I decided to try out not eating for 2-3 days and see if the heart nourishment can keep me steady. I hadn't put myself 0 or 1 type harsh goal, but the way it finally turned out was I didn't take any solid food for 2.5 days post the last lunch in the retreat. I had also thought of exploring a total fast, but that didn't work out and I consumed 4-5 cups of liquid in this 2.5 days period. I am sure that this is like amateur practice to any person who fasts with some discipline, but for me it was the longest fasting experiment and the first one based upon love. I feel that it was really the deep receiving of love in the retreat including that dinner, which led me to not have strong urge for eating while sticking to my regular work schedule for those 2.5 days. Overall this experiment, gave me confidence that the heart nourishment was real and I probably am building some traces of rootedness to value the love I receive. I am not sure if there is any value to such a thing, but let me consider the fast as an offering to all the volunteers and people in the retreat, etc. as my humble acknowledgement of the love received. May all be blessed. " Wow! How touching and beautiful! Gayatri, incredible flow in your writing!! !